A treasure box of some brilliant budding writers. 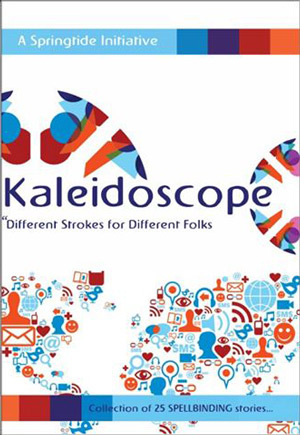 Kaleidoscope is an anthology – a collection of short stories written by 25 budding Indian authors (an initiative by Springtide). Some stories were mind-blowing, some didn’t belong in a book. This is my favourite. There is no story, really. Just a girl and her operation experience. What operation? We don’t know. But we get unfiltered access to her thoughts. It’s witty, hilarious, random. A perfect example of how storytelling is as important as story, if not more. Brilliant imagination. Good writing. Wonderful narration. This story caught me off-guard. Remarkable piece of work. Can’t wait for Parul’s novella. Well written, and builds up the suspense remarkably well for a short story. Goes a bit filmy on visual description but a great piece of work, nevertheless. Perfect for a short story. Well written, well executed – creates a shock element but just a one-time read. The shock won’t come back again. Wonderful imagination and build-up. A perfect piece for a short but could’ve been a little better on narration. A sensitive, emotional tale that would have been brutal in some other format than a short story. It’s not very believable in the beginning and starts to fail at some points; but it’s gripping. Good narrative. Some of the other stories were alright – either cliché, or they just didn’t make a mark. Boring, thanks to the over-attempt. A short story needs to grip me with the first paragraph, if not the first line. These went on and on and on and on with God knows what jewels of wisdom or back-story. Unbelievable: Overactive imagination is great; but if you can’t make me believe it, don’t attempt it. Lack of editing: So many unwanted details, heavy-fancy words, and loads of lazy, boring, and trying-to-be-smart writing. These are budding writers, so thought it’d be better to combine the problems than discourage by criticising particular stories. The book is a great treasure box of writers who are way better than some popular-but-crap writers. PS: Crap book cover, looks like it was done in MS Paint. Typesetting wasn’t great either – inconsistencies and italics were overdone with a type that wasn’t meant for it. Horrible formatting, no consistency. PPS: I wanted to read the stories before the author’s bio. Reading about the author can create a bias. It’d have been better if writer’s bio were after their stories. Published on August 27, 2013. Updated on September 30, 2013.